Meet the man behind fixedwheel. 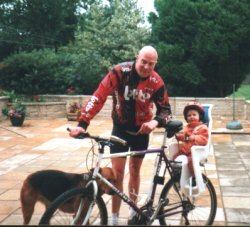 I started cycling in my early teen's (early 70s), first of all riding home made tracker's around the local wood's and dissused quarry's. As a small group formed we started to organise our own races and jumping competition's around tracks we built ourselves. I trace both my cycling and competitive cycling back to these day's. 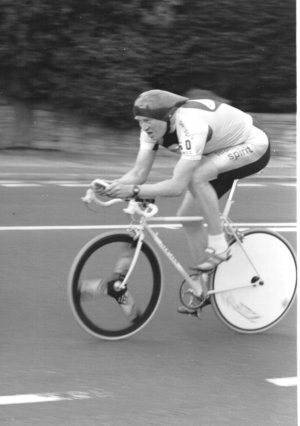 At the age of 14, I joined my local cycling club Buxton CC. I enjoyed my cycling and started to ride in club and then open time trials, with limited success. 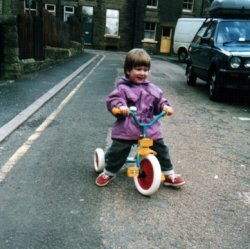 I was greatly influenced by the big gear men of the day, thinking that was the way to go fast. At this point my personal best's were a 24 minute 10 and a 1hr 4 min 25. Then in the late 70s disaster struck, I got a tumor on my right femur just above my knee. The swelling on the bone affected my knee and put me out of action for a few year's. 3 operation's later I started cycling again but this time the big gear's were history. This led me to fixedwheel riding and I have never looked back. 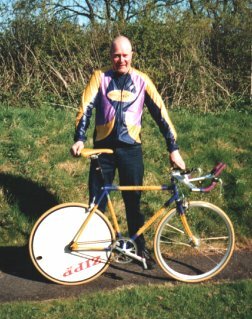 In my comeback year I managed to reduce my 25 time to a 59-21 using 87" fixed, and within a few years I was going well enough to win a few open time trial's on the same gear. So what's happening now ? For the last 15 year's I have averaged over 10,000 miles each year, and every year during the 90s that has been over 12,000. I am now a member of the peak district based club Team Spirit, this is a small but very active club and has enabled me to further enjoy my riding and improve my performances. I have reduced my 10 mile personal best to 20-41 and my 25 to 54-51 both on 100" fixed. I am a great fan of the medium gear event and have personal best's of 23-31 for 10, 34-19 for 15 and 58-51 for 25 all on 72" fixed. So here we are, late June 2000, over 6 months have passed since I wrote this page so I feel an update is in order. At the start of this season I was asked as usual, What are your aims for the coming season ?, and as usual I said I would just ride and take things as they come. Then after further pressure I said I would like to do well in the medium gear league, and maybe even try to win another MG event. I rode most of the MG events which meant getting up very early on Sunday mornings for the long journey south ( its a strange feeling setting off for a race when people are going home from the local night club ). It all turned out to be worthwhile, I won the last event in the league and shared top spot with Rick Laws. Oh dear, I need some new aims, The Team Spirit best all rounder competition looks like a good one. Some people may think a club BAR is a bit of a come down, Oh no not this one, I have a great deal of respect for my clubmates and take their challenge very seriously. Keep an eye on the Team Spirit site for the results and BAR table as they unfold. This is me in the Stretford Wheelers 10, on the Chelford based J2/1. I used 95" fixed, which turned out to be a good choice. I won the event with a 22-32. I managed to ruin my 2001 season by getting back to fast riding too soon after flu, I had 3 weeks off the bike and a further 3 weeks steady riding but it wasn't enough, let this be a lesson. I managed to salvage something of the season by winning the Team Spirit BAR, 10, 25 and freewheeling championships. Thank goodness the events were all late season. New bike, new era (Vet). Watch this space. the new bike feels good and the old legs feel great. First target for 2002 was the medium gear league and after a poor start I was delighted to win the Kent Valley 25 and the overall league. The next target I set myself was to get at least 4 veterans standards and I am pleased to report success at 10, 25, 30 and 50 miles. My next targets are the Team Spirit championships and I am delighted to report gold medals in our 10 and 25 mile competitions. A real suprise for this 15 stone vet was the silver medal in our hill climb championship. My next target was the season long club BAR, with only one other rider doing the 50 I took the senior championship. The vets scratch was a different story, being pushed to the last event of the season I felt very pleased to win this one in my first year as a vet. The vets Standar BAR was never on the cards due to a certain 70 year old beating the hour (Dave Whitnell) but the bronze medal will go nicely on my shelf. My final aim of the year was to ride the national hill climb championships on the Cat & Fiddle, to do this I rode several open hill climbs finishing top half which got me into a heavily oversubscribed field. After the initial event was called off due to awful weather I managed to hold on to some form of fitness to finish 58th at the second attempt. Well I am sat here early in January contemplating the coming season, as usual the medium gear league is high on my list to start the season off. The second half of the season will bring something very new to me, I have decided to give the 12hr a go, watch this space. Due to personal reasons I had a break from racing, I tried to keep in touch with my old friends and the cycling world, I really missed the whole scene. Having ticked over just riding occasionally, I had a little play at a few local time trials late summer, with very modest results I found myself really enjoying getting back to my old self. I rode a few 10's with my lovely lady Gail on the tandem and we ended the season on a high winning the Manchester & Dist Christmas 10 on the tandem. So here we are early 2010 and planning my comeback, swine flu and heavy snow behind me I am really keen to get going. My other loves in life.